The Valle Crucis Abbey lies at the foot of the Llangollen mountain range would have been an ideal location for austere Cistercian monks who deliberately chose wild and isolated locations for their monasteries. It was founded by the ruler of northern Powys, Madog ap Gruffudd Maelor on 28th January 1201. During the 15th century the abbey became renowned as a place of learning and scholarly excellence but following the Dissolution of the Monasteries under Henry VIII, Valle Crucis gradually fell into decay. 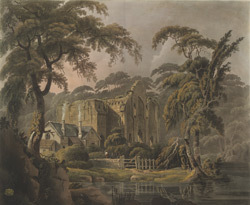 A unique feature of this abbey is the great fish pond, which can be seen in the foreground of this print.